Organizations are challenged with the spiraling overhead associated with storing and processing ever inflating sets of cybersecurity data. Many admit they are struggling to evidence improved security event detection and decision making. A growing realization is that big data must be turned into smart data: relevant, high-quality data which can be easily leveraged for advanced analytics. Cybersecurity professionals have come to understand that ingesting data into a data lake and utilizing it to create value are two distinct challenges, particularly when there is a desire to conduct advanced analytics. After heavy investments of time and resources to collect data in bulk, many cybersecurity data analytics efforts flounder on the shoals of complexity. 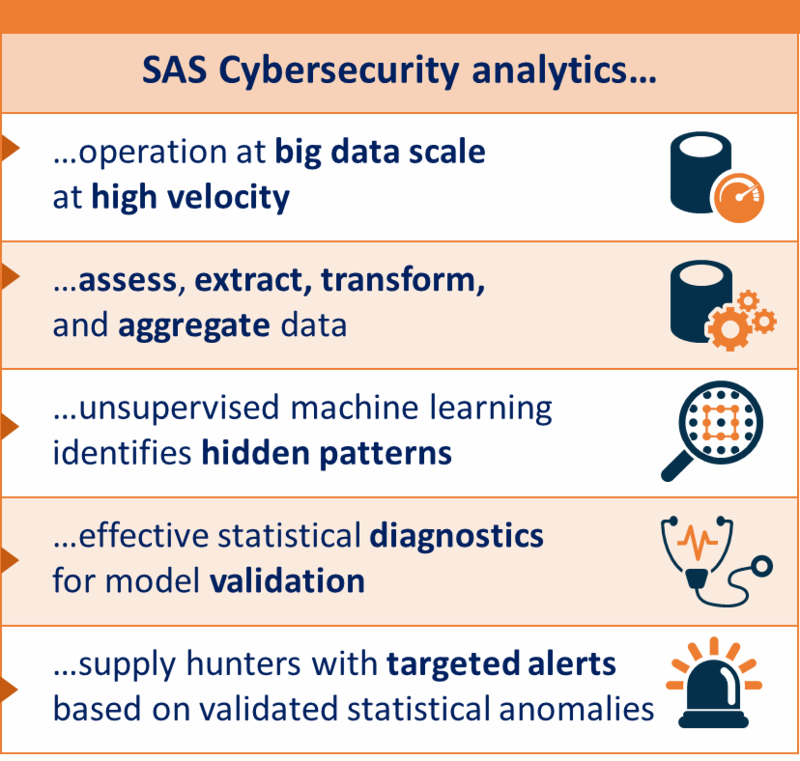 SAS Institute, the global leader in analytics for over 40 years, has a focused set of solutions to gain control of your cybersecurity big data. The first step is to improve data management, particularly quality and relevance. Data feature selection indicates which data is most relevant to the inquiry at hand, reducing and optimizing the data imprint. SAS provides a powerful toolset of routines for variable and dimensionality reduction, feature engineering, and correlation analysis. Data routines produce insights into data quality lapses along with a variety of treatments to manage these lapses, including reduction, sampling, and/or guidance concerning binning. This includes improving insights into the network itself: the discovery and mapping of user, network, device, and digital assets, even the identification of unregistered or unknown entities. Cybersecurity professionals struggle to manage unknown-unknowns (i.e. zero-day or hitherto unidentified attacks), both unseen vulnerabilities as well as the threat of complex, evolving attacks. Data analytics empowers the discovery of hidden patterns and the detection of evolving threats. Data analytics can be applied to discover patterns regarding network assets and usage, including the nature of hidden assets, and to profile patterns in associated behaviors. By establishing a baseline concerning categories of assets and users (the ‘Norm’), a foundation is set for anomaly detection. When asset access, device behavior, and/or user behavior fall out of categorized ranges, anomalies indicative of potential incursions, misuse, or abuse surface. 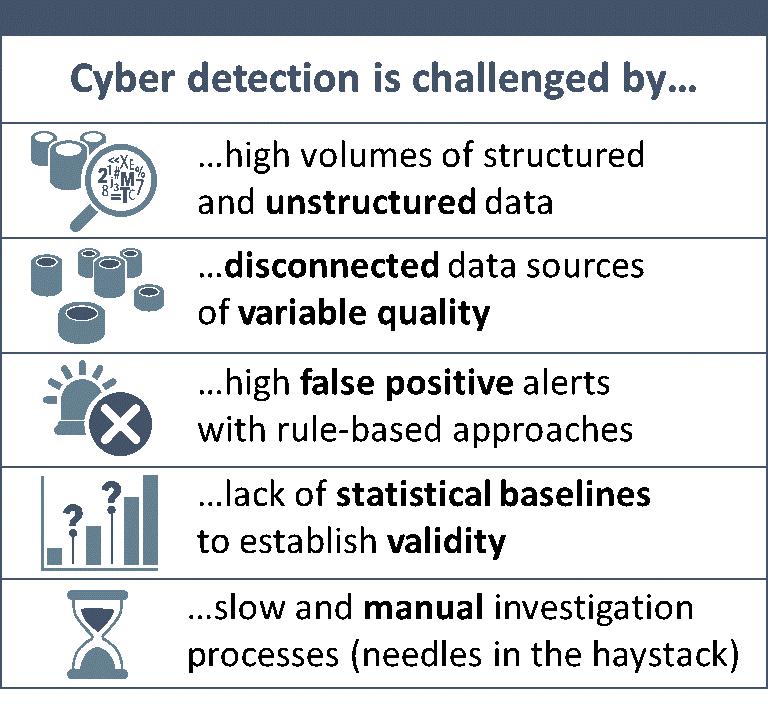 Should there be a record of known compromises, predictive detection models can quickly be tested and implemented However, given rarity and the evolving nature of attacks, such examples are not always available. Via semi-supervised machine learning, an initial detection model can be bootstrapped to detect focused statistical anomalies. The resulting model allows for targeted contextual alerts when anomalous signals suggest at-risk users and assets are potentially being compromised. 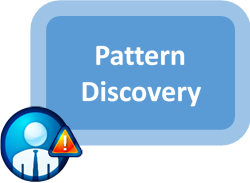 The underlying anomaly detection model is refined and improved as cases are confirmed or rejected through subsequent investigations. 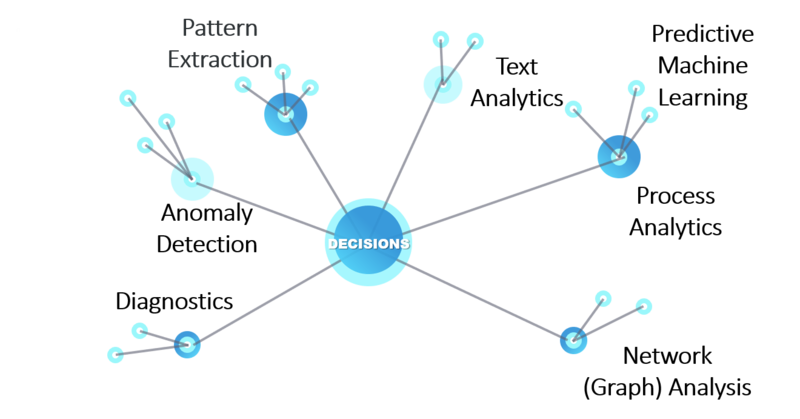 Bound together, the combination of discovery and detection analytics approaches iterate in a cyclical fashion to refine targeted understanding. A robust environment is provided for managing, iterating, and testing detection models. A range of advanced analytics and machine learning algorithms can be tested like-to-like to select and deploy a champion model. A robust set of tools are available to support both cybersecurity investigators and case workers. Investigators can utilize preformatted investigator dashboards and reports, including the ability to run self-service analytics. As needed, a powerful cybersecurity case workflow platform is available to support case workers in routing triaging, and remediating alerts. SAS offers targeted solutions to support resource workflow optimization in the context of evolving risks. 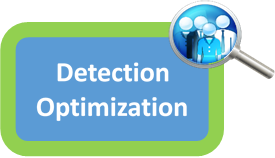 As detection models improve cyclically, workflow metrics are analyzed to support intelligent routing and resource optimization. As well, an organization can pilot new workflows and observe results before implementing in full production. The full whitepaper is available here.